With the outbreak of war, came shortages of everything and major changes to civilian life. Materials like silk and wool were needed for the war effort, and many clothes in the 1940s were made from manmade fabrics such as rayon and synthetic jersey. By 1941, clothing rationing came in and the government utility scheme forbade the use of trimmings and certain materials as fashion become subject to government decree. With men fighting in the war, the female role changed and women were directed into war work. 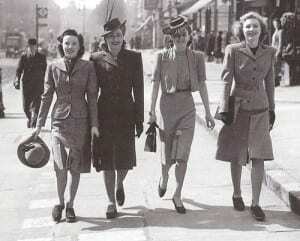 Fashion took on a conservative and military style as women wore utilitarian clothes with stiff tailoring and uniformity. Female curves were hidden once again, as the nipped in waist and narrow skirts produced a slim shape. Ladies utility suits were often refashioned from the existing male suit. As women got used to wearing trousers at work, slacks and pioneer pants became popular as well as the military inspired trench coat. To dress up eveningwear, women made use of sequins and beads, which were not rationed by the war and covered up with the Bolero jacket. The British public were encouraged to Make, Mend and Do to restore and update clothes. Tea dresses were also a popular clothing choice, which we regularly associate with the 40s. The tea dress is a style that is most reproduced in vintage inspired high street lines. They made use of prints and patterns and gave women colour and originality during a period of drab wartime clothing. Wearing patriotic colours of red, white and blue became popular in both Britain and America, with names such as air-force blue, army tan, flag red and cadet blue making the wearer feel they were helping the war effort. Red was often used to dress up the drab blues, browns, greens and black that became the uniform of the decade. Suits: Most shapes, boyish and hourglass.